MANILA, Philippines – PhilPop, the country's premier songwriting competition, revealed its roster of interpreters for the 2018 lineup. With the theme "Music. Powered by Pinoys," the foundation continues to defy expectations by championing homegrown talents from different backgrounds and music genres. Davey Langit and the band for Kenneth John Pores' "AEIOU"
Feel Day and Hans Dimayuga for Jeriko Buenafe's "Ako, Ako"
Wincet Jacot and Medyo Maldito for Eamarie Gilayo and Jovit Leonerio's "Away Wa'y Buwagay"
Michael Llave for his own song "Bumbero"
Ferdinand Aragon for his own composition "Di Ko Man"
RJ dela Fuente for Mark Jay Felipe's "Ikaw Ang Aking Pag-ibig"
Jex de Castro for Carlo Angelo David's "Isang Gabing Pag-ibig"
Acapellago for Philip Arvin Jarilla's "Kariton"
Ataska and Nash for Sarah Bulahan's "Kelan Kaya"
Carlyn Ocampo and Joshua Feliciano for Karlo Zabala's "kilabI"
Leanne and Naara for Jeremy Sarmiento's "Korde Kodigo"
Cacai Bautista for Elmar Bolaño and Donel Transporto's "Laon Ako"
Russ Cabico for his own entry "LDR (Layong Di Ramdam)"
Kyle Pulido for his own material "LGBT (Laging Ganito Ba Tayo?)" Bayang Barrios and Niliyagan for Agatha Marallos and Melvin Joseph Morallos' "Lilipad"
BennyBunnyBand for Edgardo Miraflor Jr.'s "Loco De Amor!" Carlo Angelo David for his own track "Makisabay"
Caleb Santos for Paul Hildawa's "Mahirap Magselos"
Nitro for Marvin Blue Corpus' "Malilimutan Din Kita"
Jeric Medina for Oliver Narag's "MMRA"
Chud Festejo for his own composition "Nanay Tatay"
Thyro Alfaro for Aikee Aplacador's "Oka"
Jem Cubil for Barry Villacarillo's "Perfectly Imperfect Human"
Julian Trono for Sean Gabriel Cedro and John Ray Reodique's "Pilipit"
Yumi Lacsamana for Aikee Aplacador's "Promise Sorry Note"
The Juans for Agatha Morallos and Melvin Morallos' "Pwede"
Katrina Velarde for Michael Rodriguez and Jeanne Columbine Rodriguez's "Tama Na"
Therese Villarante for Therese Marie Villarante and Henrick James Pestaño's "Unang Adlaw nga Wala Ka"
Ignacio Dennis Roxas for his own song "Utang"
Eunice Jorge of Gracenote for Donnalyn Onilongo's "Yun Tayo (Formerly Taken)"
A video featuring the 30 interpreters was presented during the press conference on September 12 at the 2nd floor of Cafe 1771, Pasig City. Official Song Recording (OSR) Reveal of #Philpop2018 top 30 semi-finalists with Festival Chairman, Mr. Ryan Cayabyab. During the program, Festival Chairman and Philpop Board Member Mr. Ryan Cayabyab stressed the importance of regional inclusivity and giving voice to underrated artists whose compositions have the potential to impact the Filipino people's soul. Philpop Board Member Mr. Ryan Cayabyab. "This year, we are happy to launch 30 songs that represent stories, struggles, ambitions, and dreams of people like us. We look forward to listen and enjoy these wonderful compositions." Cayabyab also expressed PhilPop's advocacy promoting top-notch Filipino music that matters. "Rest assured that we will stay true to our commitment to look for talented songwriters and give them a platform to realize their dreams of seeing their songs across the nation." Viva Records, for its part, supervised the official recording of the songs which will be available on platforms such as Youtube and Spotify on September 17 at 12 noon. Listen to the songs here. From the shortlisted Top 30 semi-finalists, only ten will advance to the final round. They will be judged according to the following criteria: 50% judges screening, 25% online streaming, and 25% Smart's People Choice Award voting through SMS and Twitter's conversational ad. 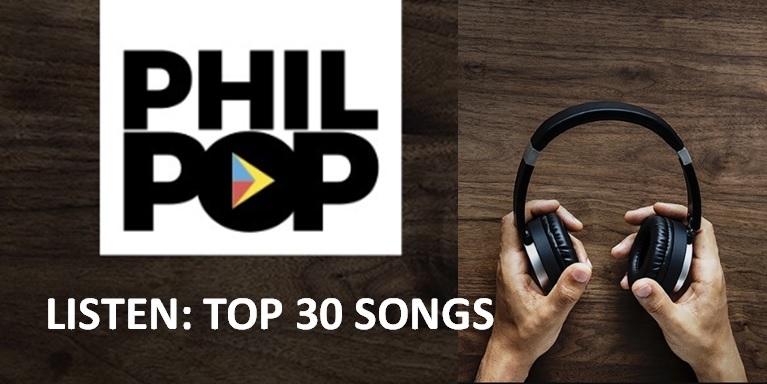 The top 10 will be revealed via PhilPop's social media pages and website on October 22, 2018. The finalists will be given a chance to showcase their original composition as interpreted by the chosen music acts on November 30 in the PhilPop Festival Finals Night that will be held at Capitol Commons in Pasig City. Log on to www.philpop.com.ph for the complete instruction on how to vote for your favorite songs via SMS or Twitter. PhilPop takes pride in its advocacy to provide a sustainable platform for Filipino music acts to develop their skills through a world-class mentorship program, as well as introduce them to standard music industry practices and strategies that would harness their potential in the long run. PhilPop 2018 is an initiative of the PhilPop Music Foundation, chaired by Mr. Manny V. Pangilinan.